Top 31 Romi Neustadt Quotes from "Get Over Your Damn Self"
Romi Neustadt is a seven-figure earner with Rodan & Fields. She hit that achievement level in less than three-years, which is very impressive. Prior to joining the business, she was a lawyer and corporate executive. I was recommended this book by a close friend. I read it over a weekend and absolutely loved it. It’s loaded with great tips and wisdom that would benefit any entrepreneur or network marketer. In the paragraphs below, I’ve listed some of my favorite Romi Neustadt quotes in chronological order. Each quote is in bold and italics. After each quote, I will share my own two-cents on the topic. Enjoy. I agree. How and what we think will have a huge impact in our business. We can either be our own biggest cheerleader or our own biggest critic. Work on your self-talk. Do daily affirmations and look for the positive in things. Work harder on yourself than you do in your business. # 2 I was coachable and consistent and added at least three to five new business partners and a handful of customers every month. In my opinion, this is the key to success in network marketing. Consistently sponsor new people and find new customers each and every single month. Steady pace wins the race. Whatever you do make sure you don’t keep stopping and starting. This business is a marathon, not a sprint. # 3 This biz is anything but EASY. It’s hard. Really hard. It’s going to test you in ways you never imagined. It will have tremendous highs and cavernous lows. I love that she shares this wisdom with her readers. Many people are told that it’s easy to succeed in network marketing. It’s not. It’s really hard. Starting and growing a successful business of any kind is very difficult to do. You have to be mentally tough and take the long-term view. # 4 If someone isn’t seeing success, it’s almost always because they’re not following the system, either because they don’t trust it or because they’re arrogant enough to think they can do it faster, stronger better. The system is the solution. All successful businesses have systems. Find out your team’s system and don’t deviate from the system during your first year in the business. Don’t try to reinvent the wheel and do everything your own way, especially if you are new or have never achieved success in the industry before. # 5 In this profession, every time your mouth is closed your business is closed. We get paid to talk to people. You should make it a goal to talk to at least five new prospects each and every single day, all while you are out and about living life. # 6 Too often, new business builders hide behind getting ready to get ready, because it’s safer. Stop getting ready to get ready. Get into ACTION mode. Take massive action. You will never know it all. Don’t think you need to have all the answers before you get started. And remember this, ACTION cures fear. The more you do the things you fear the less you will fear doing those things. # 7 There are so many things in life vying for your time and attention that if you don’t really want to do this, you won’t. You can either make money or you can make excuses, but you can’t do both. People always have time for the things that are important to them. Your business needs to be a top priority if you want to succeed, right behind your job and family. # 8 This is a business of attrition. It is a numbers game. Most people you talk to will not join. Most people who do join will do nothing and quit. Fortunately, you only need to find a few quality people to build a big business. Even if 75% of your team quits every year, you can still build a huge team and solid residual income. # 9 You may feel like you want to quit, but you’ve got to commit to work 18-24 months as hard and as smart as you can. When you start a new business of any kind, the goal the first year is simply to survive. Most businesses take at least one or two years to make their first dollar of profit. This is not the lottery or some get rich quick type of business. # 10 You’ll be much more effective if you lead with the business and default to the products. I couldn’t agree more. While finding customers is important, it should be a byproduct of looking for distributors. Plus, most people want to make extra money, so leading with the business is a great idea. # 11 None of us know what anyone is thinking, so all the time and energy you spend speculating is a waste. Don’t pre-judge anyone. Share what you have and let them decide for themselves, whether or not they are interested in your products or business opportunity. At the end of the day, you never know who will join or who will build it big. # 12 The key to adding to your list all the time is to get out of your house and make new friends every day. Get out of your house and live life. Find fun activities you can do. Meet new people. Most of us come in contact with hundreds of people each and every single day, without even realizing it. Open your mouth, say hello, and be nice to people. # 13 Remember, the person you’re talking to about your business and your products is more important than you. Whenever you talk with a prospect, focus on them. Make the conversation about them. Ask a lot of questions and listen to what they have to say. Do more listening than talking. # 14 The most important thing to remember in handling objections are: don’t get defensive and don’t go into convincing mode! Objections are a natural part of the buying process. Most people will have objections before they join, and most people who do join will not sign up on the spot. Your job is to answer each objection and lead them to a buying decision, without using hype or pressure. # 15 If you’re truly reaching out to enough people to keep your funnel full, you won’t have any attachment to the outcome of any one person. I love this lesson. If you only have one or two prospects in your pipeline, you will worry about what they think. If you have hundreds of prospects in your pipeline, you won’t care what any of them thinks. Keep talking to new people and keep adding people to your list. The bigger your pipeline, the more recruits and customers and referrals you will get. # 16 Do you really want someone on your team who doesn’t show up, or has the class to give you a head’s up of a conflict or a change of heart out of respect for your time? You are not looking for wimps, weenies, or flakes. You are looking for entrepreneurial minded people who are success minded and willing to work. Let the slackers go and hold people accountable. # 17 Growing a successful team and a lucrative income requires duplication. You cannot build a big team all by yourself. Trust me, I’ve tried. You’ll never make it big in network marketing just by recruiting people. Ultimately, it’s about duplication: having a team of a lot of people who all do a little bit each month. # 18 The only part of this business that we have total control over is our own activity. Focus on what you can control and don’t worry about anything else. Focus your time on the money producing activities and take massive action. # 19 I’ve learned that people ultimately will join your team because of you and your energy. People join people, not businesses. Make sure you are someone worth joining. # 20 Your people will do, on average, half of what you do. Never expect your team to do more than you are willing to do. Lead by example at all times and inspire others by your actions. # 21 I had to set the pace and then see who kept up. Those were the ones who would get my time. Work with the willing. 95% of your team will not be willing. Focus on the people who are coachable, hungry and willing to work. These are the folks who will duplicate and help you grow a big team. Spend your time where it is deserved, not where it is needed. # 22 We can teach. We can coach. We can inspire. We can collaborate. We can laugh. We can have fun together. We can dream. We can plan. But we can’t motivate. That has to come from within each one of us. Each person on your team is their own CEO and is responsible for their own motivation. Yes, your job is to support and help them when needed, but you can’t drag anyone across the finish line. # 23 After learning the basics, the best way to teach our people how to grow is by doing three-way calls with them and their prospects, and helping to strategize with them as they start building a team. Utilize three-ways calls with your team members whenever possible. This lets you work smart, share your knowledge and free up some of your time. Plus, you can do it on your schedule, right from the comfort of your own home. # 24 What we put out in the world is what we get back. The Law of Attraction is always working, either for you or against you. # 25 Every mistake is an opportunity to learn and grow. You fail your way to success. You will learn more from your failures than from your successes. Don’t be scared to fail. Just don’t make the same mistake twice. # 26 As a business builder grows an organization that will start to take on a life of its own, I strongly believe she should spent at least 85 to 95% of her time on personal prospecting, training newbies who are coachable and responsive, and doing three-way calls for her team. Never stop your personal recruiting. Always focus on the income producing activities. Never go into management mode. # 27 Do not do anything in person that you can do over the phone or via FaceTime. Leverage technology whenever possible so you can work smart. Don’t waste time driving around to meet with people if you don’t need to. Time is money! # 28 Make personal development part of your team culture. Get your team members reading books, talking with mentors, listening to tapes and attending events. The more you help your team members grow, the more your team will grow. # 29 I hope you’ve learned by now that your business will likely succeed or fail because of what’s between your ears. Ultimately, we become what we think about most of the time. Make sure you are thinking positive thoughts. Remember that you CAN succeed in this business. Ultimately, you are the captain of your own fate. # 30 You are your most important team member. The most important person to recruit is yourself. If you aren’t 100% convinced about your business, products, or the industry, you will never make it. # 31 Don’t chase the accolades and the recognition. Don’t try and be the best, fastest, top earner, or biggest cheese. Try to be the best you can be every single day, for you, your loved ones and your team. Make it a goal to simply get a little bit better every single day. Keep doing that and the Compound Effect will kick in and take over. 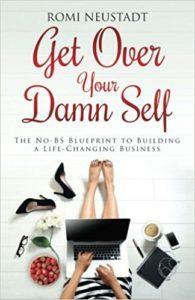 Get Over Your Damn Self by Romi Neustadt is published by LiveFullOut Media. The ISBN is 978-0-9979482-1-9. It comes in softcover and Kindle format and is available anywhere books are sold. Romi is a former lawyer and corporate executive. Within three years of joining Rodan & Fields, she became a seven-figure earner. That allowed her husband to retire. Romi Neustadt lives in San Diego with her husband and two children. She is a respected author, entrepreneur and network marketing professional. You can visit her website here. There you have it folks. These are my top Romi Neustadt quotes from her best-selling book “Get Over Your Damn Self.” Which quote is your favorite and why? Leave a comment below to share your thoughts. I look forward to hearing from you.